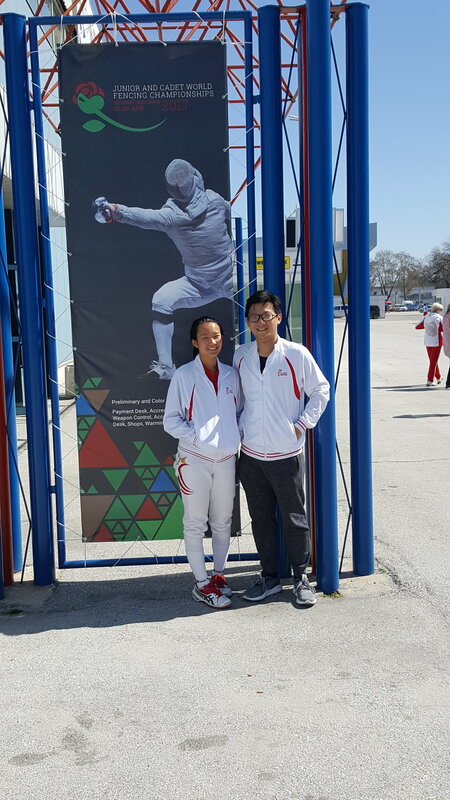 Each Junior fencing season concludes with the Asian Championships at the end of February and the World Championships at the beginning of April. The top four fencers in the national ranking are selected to represent Singapore at these events. This season we were proud to have both Ywen and Nicole selected into the team, as they finished ranked #1 and #2 in the Cadet rankings and #1 and #3 in the Junior rankings. This would have been Ywen’s final year in the Cadet event, and her chance to win another medal at the World Championships. However tragedy struck when she was ruled out of participation in the World Championships due to a back injury which had plagued her the whole season. The pain had already severely restricted her movement during the Asian Championships to the point where she could not fence the team events. A medical check on her return revealed the severity of the injury, and she would need to spend the next few months recovering. She was incredibly disappointed but we hope that she will return much stronger for the following season. Despite the pain, Ywen did well in both the Cadet and Junior events at the Asian Championships, finishing with a Bronze in the Cadet event after going down 12-15 against Korea, and finishing in the quarterfinals in the Junior event where she lost 10-15 against Japan. For Nicole, it would be her second appearance at the Asian Championships but her first ever World Championships event. In the Asian Championships, Nicole started the poules a little nervously, and did not get a good seeding. She was matched against a Korean in the round of 16, and put up a good fight but unfortunately went down 12-15. However, Nicole showed great character in picking herself up for the team event, where she anchored the team in the absence of the injured Ywen. The team performed admirably and managed the beat Japan into 3rd place, after they had put up a great fight in the semi-final against Korea, going down 39-45. In the World Championships, Nicole started the day well, winning four matches in her poules including one against eventual champion and top seed Liza Pusztai from Hungary. She eventually made it into the round of 32 where she lost 11-15 to Spain, finishing in 27th position out of 85 competitors. It was a good performance for a first time, and we wish her all the best as she begins preparing towards the next fencing season. The season for us has ended, and our fencers have taken a well deserved break. The work begins again towards the next World Championships in 2018, and we look forward again to competing with the best!